From weddings to birthday parties, cooperate workshops to happy hours and everything in between. We have the fun and unique space for you. 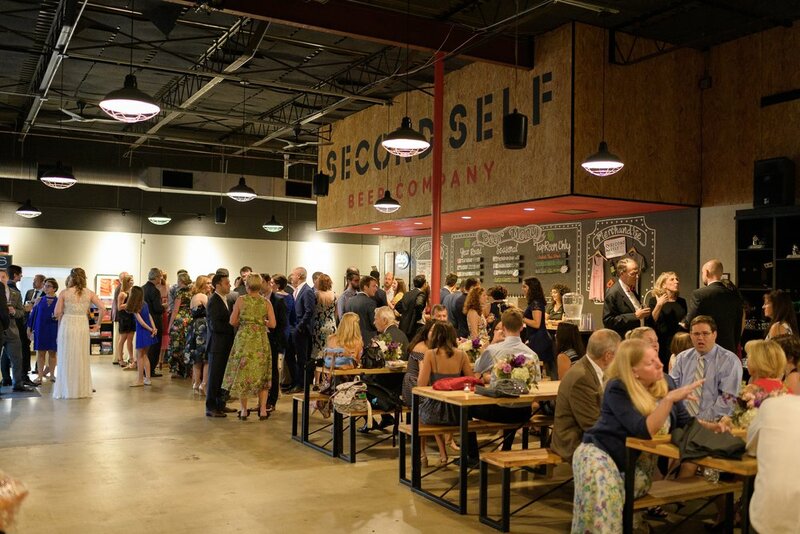 We offer two unique event spaces available for rent; our Main Taproom and the Brew House. The Taproom can accommodate up to 200 people. It is a modern, sleek room furnished with tables, chairs, A/V equipment and other desired amenities. Our Brew House can accommodate up to 100 people and is a raw, blank slate that can be transformed into a cool space. For larger events, we do offer a brewery buyout with use of our Taproom, Warehouse and The Brew House. Additional details and pictures below. For private event and rental information, please call Grier @ 205-482-2827 or click on the link below for more information. What is the Brew House? The Brew House is our second event space that is also where all the beer magic happens. This is a warehouse with an industrial feel located among our brewing system, stainless steel fermentors and aging barrels. It boasts a custom wooden bar with (8) taps available for your guest. Please note the Brew House is not climate controlled and does not have any tables and chairs in this space. The taproom has (6) wooden picnic style tables with benches that seat up to 48 people total. We also have (4) high boys and (4) bar stools. There are no tables and chairs set up in the Brew House. Any additional tables and chairs will need to be brought in by the renter. We do have Air Conditioning and Heat in the Taproom. The Brew House is not climate controlled and does not have AC. It does have a large industrial heater that does warm the space. Yes, you are welcome to bring in any catering you would like, including food tucks, though we are happy to recommend ones we feel do a great job. We do ask any caterer be licensed and insured. Please see our recommended vendor list at the end of the package. Please note we do not have a kitchen onsite and limited prep space. Do you provide bottled water or sodas? Do you have ice onsite? No, we do not have any bottled water or other non-alcoholic beverages, as well as, ice or coolers available at the brewery. Any of these items will need to be brought by the renter or caterer. Does your staff help with set up and can they move furniture for the event? While we are happy to help facilitate the process and are often willing to assist, ultimately, it is the responsibility of the renter to set up the venue and arrange any furniture in the manner you prefer. Being we are located in an office building for any night time and weekend events, parking is not an issue. For weekday events, we have approx. 40 -50 spaces available around the brewery. Parking is self serve and we do not provide valet. Please no glitter, feathers or confetti of any kind. Any candles should encased in glass and nothing that will alter the look of our walls and floor or cause permanent damage to the space. Yes, however they will need to provide their own sound equipment.